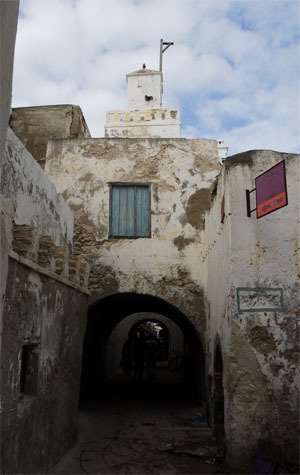 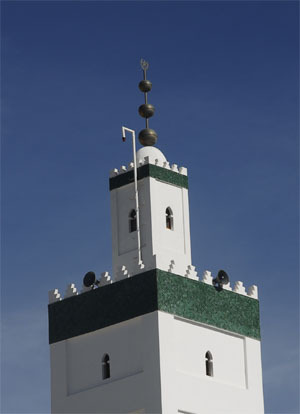 also known by the name The Kasbah Mosque. 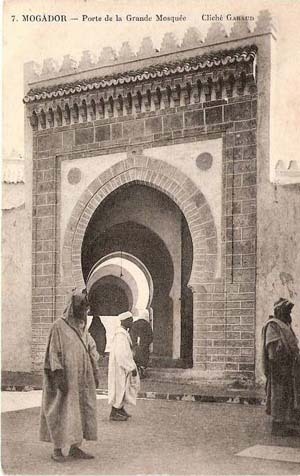 by the Sultan Sidi Mohammed Ben Abdallah. 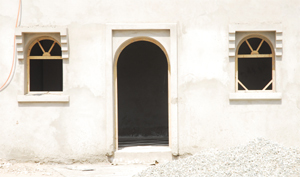 and dormitory units for students. 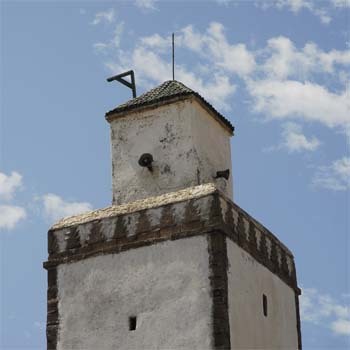 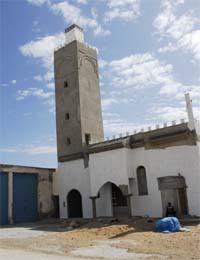 This mosque was named after the cheikh Sidi Ahmed ben Mohammed by the Sultan. 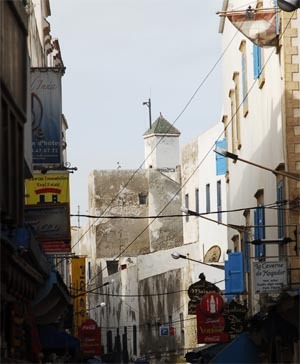 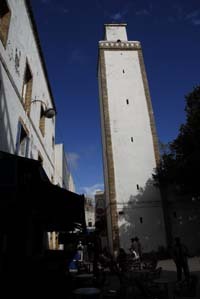 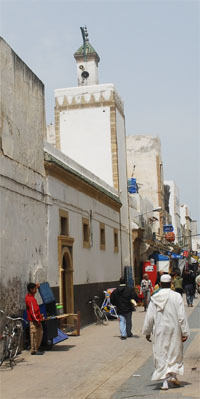 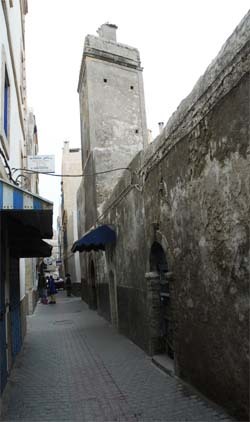 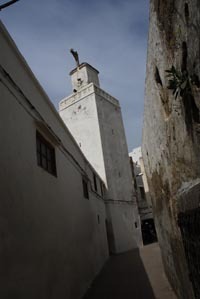 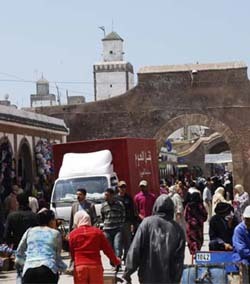 This tall minaret of the mosque Ben Youssef is rising over the medina of Essaouira. 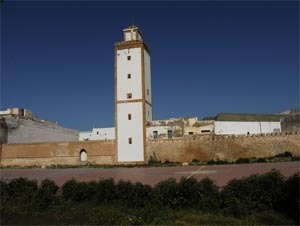 It is an impressive building which covers 2000 m2. 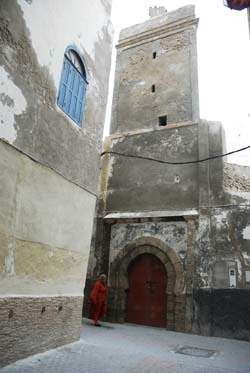 The doors of the mosque is buitifully painted in brown . 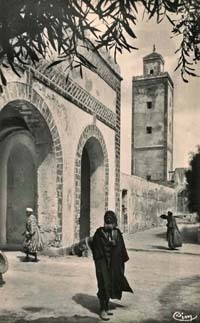 The Sultan was was a disciple of three great Cheikh theologians and named the tree most important mosques after their respective names. 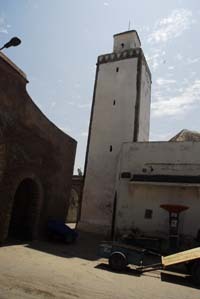 The Mosque Ben Youssef. 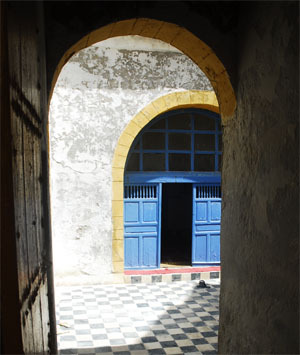 Doors open. 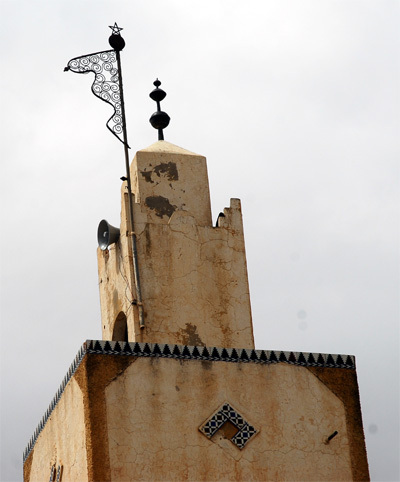 "When Islam was revealed in the early seventh century, Jews called the faithful to prayer with the shofar (ram’s horn) and Christians used a bell or a wooden gong or clacker. 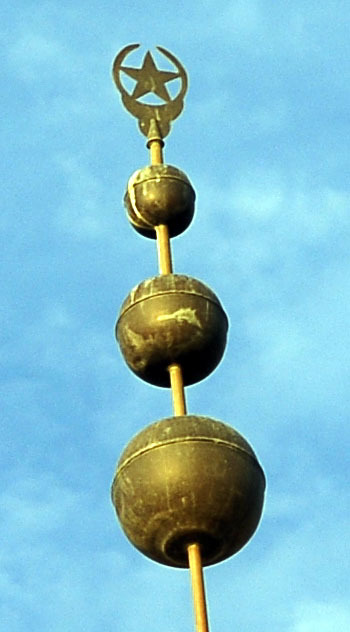 Indeed, the sound of a bell wafting in the breeze from a distant monastery is a frequent image in pre-Islamic and early Islamic poetry. 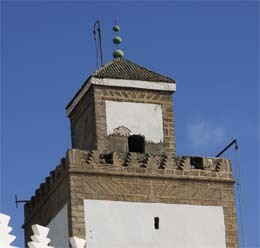 In this context, we can well understand how ‘Abd Allah ibn Zayd, one of the Prophet’s companions, dreamt that he saw someone calling the Muslims to prayer from the roof of the mosque. 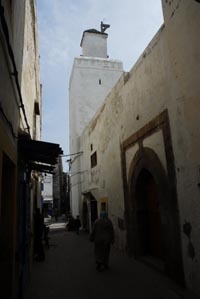 After he told the Prophet about his dream, Muhammad recognized it as a vision from God and instructed Bilal, an Abyssinian freedman and early convert to Islam, "Rise, Bilal, and summon all to prayer!" 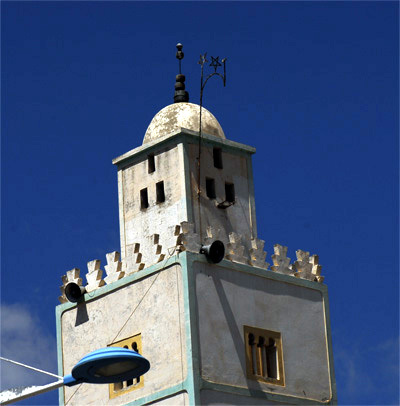 Bilal, who was known for his beautiful voice, did so, thereby becoming the first muezzin. 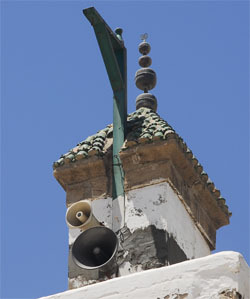 (The word muezzin comes from the Arabic mu’adhdhin, or "one who gives the adhan.")" 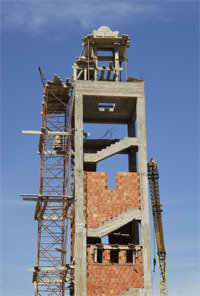 March/April 2002 print edition of Saudi Aramco World. 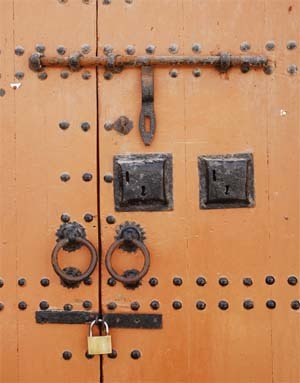 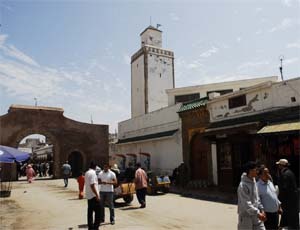 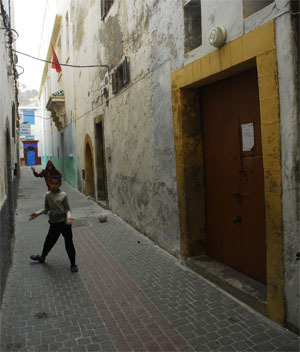 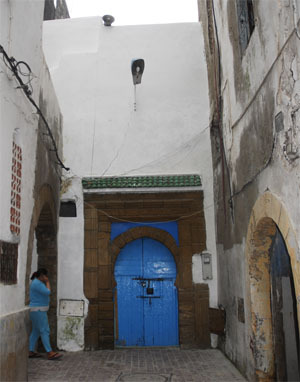 The Gnoua Brotherhood (Sidna Bilal) reside in the Zaouia, which is located in the west part of the medina, Bni Antar. 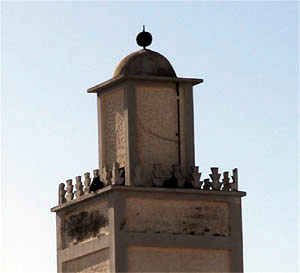 of the Ben Youssef mosque. 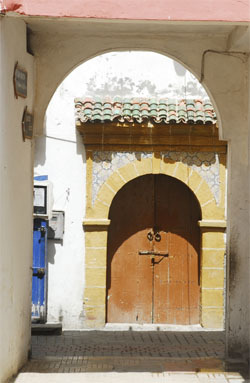 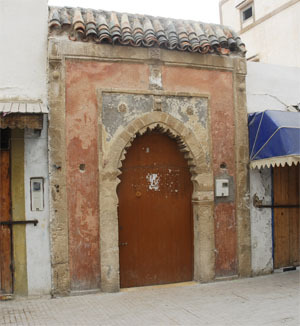 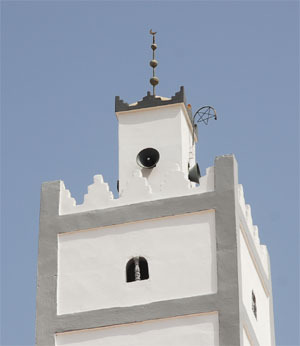 a traditional design in Morocco. 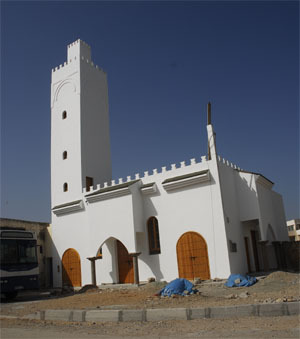 there is a Friday prayers service. 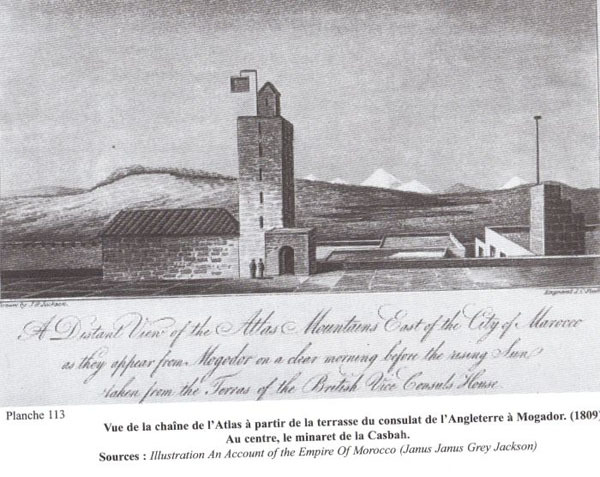 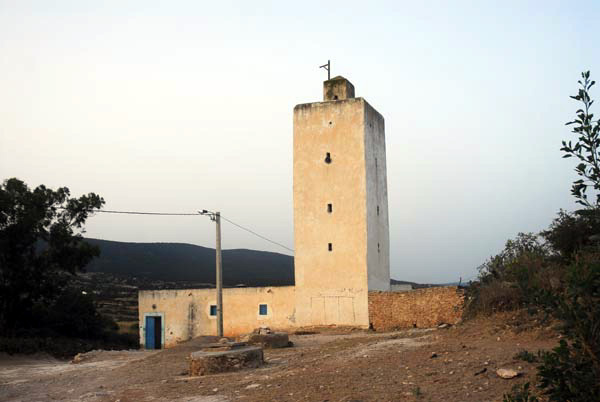 and the Zaouia Kadiria and the Mausoleum of Sidi Magdoul. 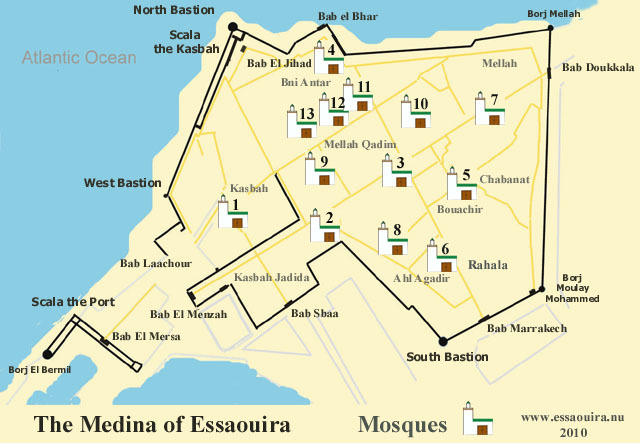 He also intalled the new quarters for the Jews - Mellah Jdid. 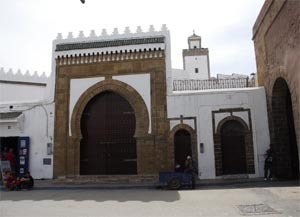 It is prohibited to enter the mosques, unless you are Muslim. 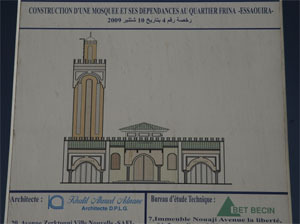 This is unfortunate since you find much of the most beautiful artistry inside the mosques. 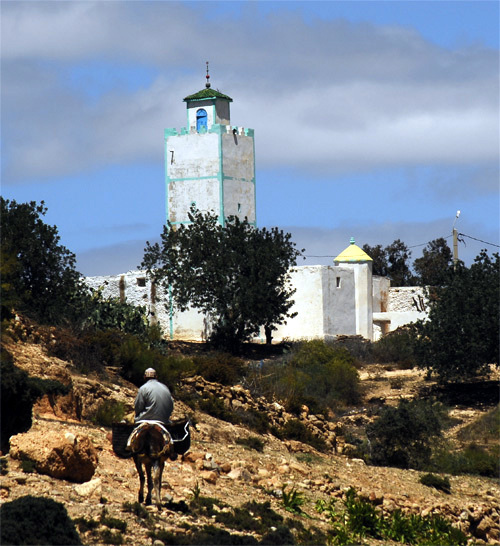 Many traditions but also everyday life in Morocco follow the Muslim calendar and in general local people have islamic values which are guiding them in actions and ethics. 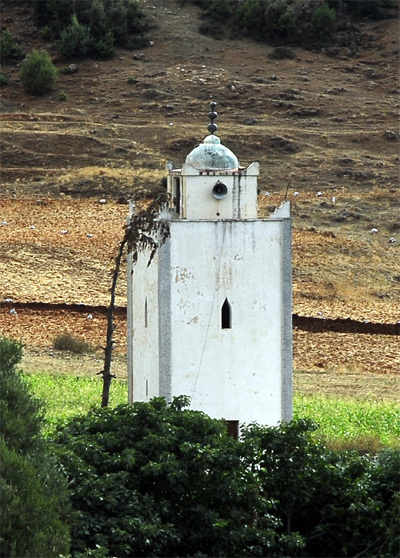 An Eco- Friendly tourist in Morocco try to study the culture and learn about Islam and Muslim practises in order to understand and show respect for local customs. 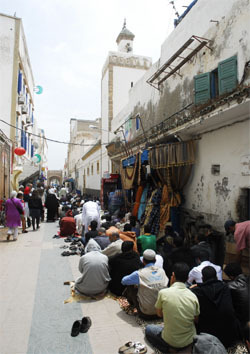 be faced when a Muslim prays during Salah. 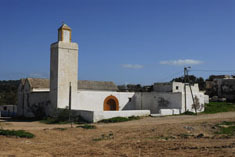 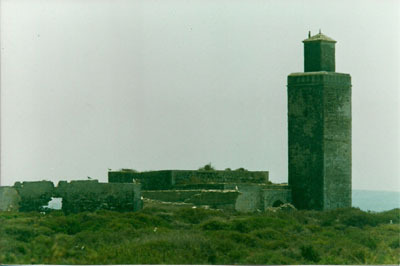 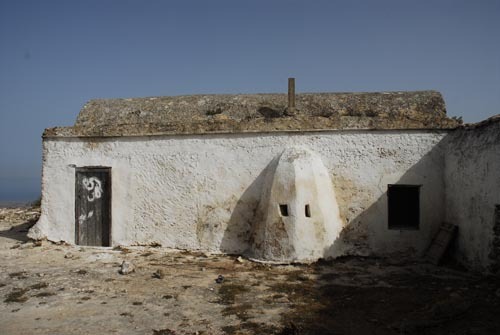 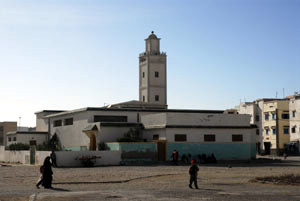 The Mosque on the Mogador Island. 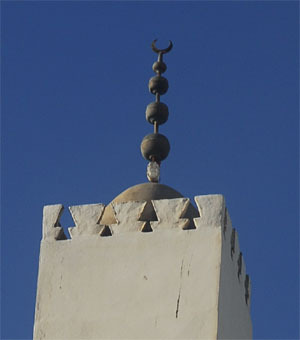 This minaret in Scala has only one ball at the top! 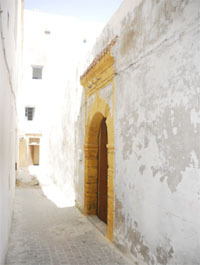 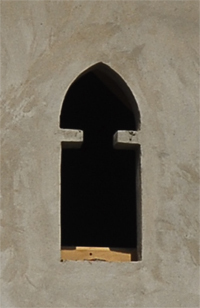 has an interesting mihrab with two small openings in the direction of prayers.